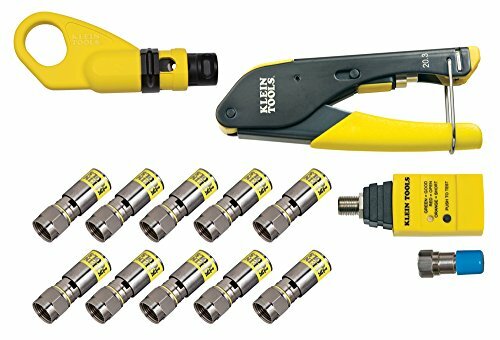 This Coax Installation and Cable Testing Kit contains everything you need to prepare, connect and test coaxial cables: The VDV110-061 cable stripper prepares multiple types of cable in common voice/data/video applications and features an exclusive sliding depth gauge and variable stripping capability. The VDV212-008SEN compact compression crimper is an advanced do-it yourselfer tool for fast, reliable F-connector installation that provides fast insertion and removal of cable and connector. The VDV512-100 Coax Explorer 2 verifies proper continuity of F-connector coaxial cables and maps their location, and the VDV812-606 Universal F Compression Connectors provide excellent holding power and signal strength you require. Includes tools needed to prepare, connect and test coax cables. COAX CABLE STRIPPER 2-LEVEL, RADIAL: Designed for easy single operation cable preparations. COMPRESSION CRIMPER - COMPACT F-CONNECTOR: Crimps compression F-connectors to coaxial cable quickly and reliably. COAX EXPLORER TESTER: Compact tool tests and verifies coaxial cable connections (good/open/short). UNIVERSAL F COMPRESSION CONNECTORS - RG6/RG6-QS: Patented universal sleeve connectors install up to 5X faster! For more than 160 years, Klein Tools has manufactured premium-quality, professional-grade hand tools that deliver the performance, durability and precision needed to get the job done right. Our family of engineers, workers and craftsman continue to put six generations of expertise into every tool we create by using only the highest quality materials, superior workmanship, and keeping manufacturing as close to home as we can. Klein isn't just the name of our company, it's also our family name. And since we're an American company that's family-owned and family-run, you know you can count on us to be here tomorrow. Klein Tools doesn't just make great products, we make great products that stand up to the demands of the professionals who use them every day ... Since 1857.